Chemical Company In West Virginia Water Crisis Files For Bankruptcy : The Two-Way Freedom Industries has been blamed for a chemical spill that left around 300,000 people without water for days. Last week, a chemical the company uses in cleaning coal leaked into the Elk River and into the public water system. Freedom Industries, which has been blamed for a chemical spill that left thousands of people without water, has filed for bankruptcy. 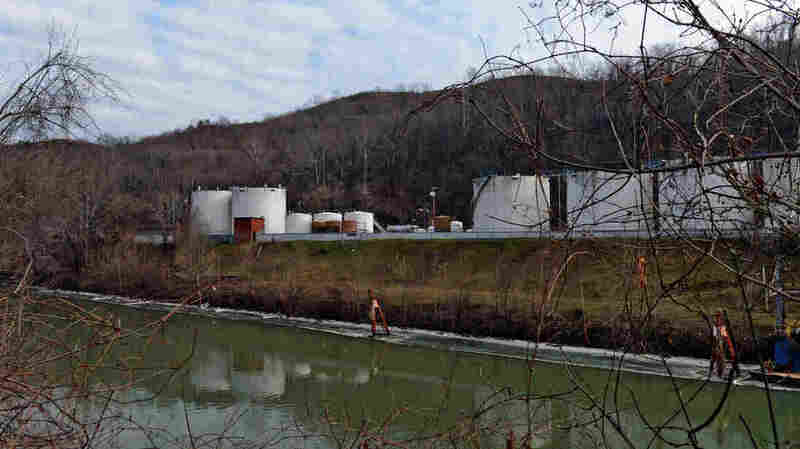 The company's facility on Barlow St. is seen here on the banks of the Elk River in Charleston, West Virginia. Freedom Industries, the West Virginia company that's been blamed for a chemical spill that left around 300,000 people without water for days, has filed for bankruptcy. The chemical used in cleaning coal leaked into the Elk River and into the public water system. It was only around midday Friday that West Virginia American Water online "water safety map" all blue, as Mark reported for The Two-Way earlier today. But the all-clear came with some caveats, as some residents were told not to risk drinking water from the tap. And the suggestion that pregnant women in the affected areas drink only bottled water still stands. According to the bankruptcy documents filed this afternoon and passed along to us by NPR's Hansi Lo Wang, Freedom Industries lists both assets and liabilities worth between $1 million and $10 million, with between 200 and 999 estimated creditors. The document was signed by Freedom's president, Gary Southern. As The Washington Post reports, a new owner took control of Freedom Industries only one week before the spill was reported. The newspaper identifies the owner as Pennsylvania coal executive Cliff Forrest. The company has been harshly criticized by government officials in West Virginia, including Charleston's Mayor Danny Jones, who told Melissa Block on Tuesday's All Things Considered that Freedom Industries is run by "a small of group of renegades." "I'm not even sure they cared what happened to the public," he said. The incident has prompted Sen. Jay Rockefeller, D-W.Va., to introduce legislation that would require the responsible companies to pay for cleaning up chemical spills and other pollution, as well as "provide more funding for states and agencies tasked with cleanup," reports West Virginia Public Broadcasting. "Rockefeller co-sponsored the bills with Senator Brian Schatz, D-Hawaii," the broadcaster reports, "who is responding to a 233,000-gallon molasses spill that occurred in Honolulu last year." As Mark reported earlier today, the chemical that leaked into the water supply is called methylcyclohexene methanol, or MCHM, and it "can cause severe burning in the throat, vomiting and skin blistering."